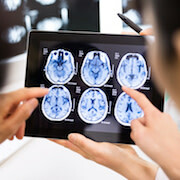 Researchers have tested a new MRI technique, called quantitative susceptibility mapping (QSM), to track iron levels in the brains of multiple sclerosis patients. They found that brain iron levels can help identify those at a higher risk for developing physical disability, according to a new study published in the journal Radiology. Multiple sclerosis (MS) is a disease that attacks three critical components of the central nervous system: the neurons (nerve fibres), myelin (the protective sheath around the neurons), and the cells that produce myelin. Common symptoms of MS include weakness, spasticity and pain. The disease can progress in many patients, leaving them severely disabled. Brain atrophy is the current gold standard for predicting cognitive and physical decline in MS, but it has limitations, said study lead author Robert Zivadinov, MD, PhD, professor of neurology at the Jacobs School of Medicine and Biomedical Sciences at the University at Buffalo (UB). "Brain atrophy takes a long time to see," he pointed out. "We need an earlier measure of who will develop MS-related disability." Iron is vital for various cellular functions in the brain, including myelination of neurons, and both iron overload and iron deficiencies can be harmful. In this study, the researchers compared brain iron levels in people with MS to those of a healthy control group using the highly accurate QSM technique. A brain region with more iron would have higher magnetic susceptibility, and one with less iron would have lower susceptibility. The mapping technique was performed on 600 MS patients, including 452 with early-stage disease and 148 whose disease had progressed. Compared to 250 healthy control participants, MS patients had higher levels of iron in the basal ganglia, a group of structures deep in the brain that are central to movement. However, the MS patients had lower levels of iron in their thalamus, an important brain region that helps process sensory input by acting as a relay between certain brain structures and the spinal cord. The lower iron content in the thalamus and higher iron content in other deep grey matter structures of people with MS were associated with longer disease duration, higher disability degree and disease progression, according to the research team. "Iron depletion or increase in several structures of the brain is an independent predictor of disability related to MS," Dr. Zivadinov said. The findings point to a potential role for quantitative susceptibility mapping in clinical trials of promising new drugs, Dr. Zivadinov noted. Current treatments involving anti-inflammatory drugs do not prevent MS patients from developing disability.